Open Europe: The Great Cypriot Game - How important is gas to Cyprus' economic and geopolitical future? 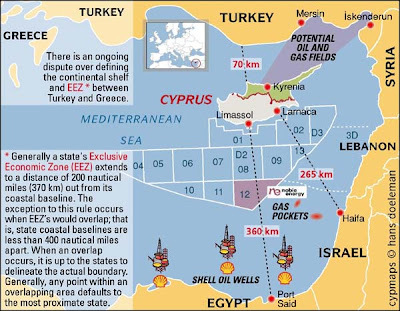 The Great Cypriot Game - How important is gas to Cyprus' economic and geopolitical future? "We had an agreement with colleagues from the euro zone that we'll coordinate our actions." "It turns out that the euro zone actions on the introduction of the deposit levy took place without discussions with Russia, so we will consider the issue of restructurisation of the (Cyprus) loan taking into account our participation in the joint actions with the European Union to help Cyprus." It seems Russia is none too happy with the eurozone approach, unsurprisingly. If it does refuse to ease the terms of the €2.5bn bailout loan it previously gave Cyprus, it could hit Cypriot funding requirements, although probably not by a substantial amount. Still it could result in eurozone bailout funds being used to pay off a Russian loan in the near future - something which may not sit well with German taxpayers. Again, the interesting fall out will be to see how this impacts Russia's approach to Cyprus and the EU more broadly. In the middle ages, Cyprus was a key battle ground between great powers seeking dominance in the region. Well, the country - which, remember, only accounts for 0.2% of eurozone GDP - could become a hotspot once more (though we shouldn't be over-excited about this). Exports from the gas fields are not expected to begin until 2019 at the earliest. Cyprus runs out of cash in June this year, a short and medium term solution is needed now. Tapping the further reserves (beyond Block 12) will take even longer. There needs to be significant investment, potentially up to $4bn to begin extracting the gas – the Cypriot government certainly cannot afford this. Although there is sizeable interest in the exploration rights, the FT’s Nick Butler notes that Noble Energy (which explored Block 12) is not bidding for further rights, which raises some concerns. Furthermore, Turkey is still contesting Cyprus’ ownership of these reserves. Although Cyprus currently has the backing of the international community, this dispute could further hold up progress in tapping these reserves. Many of the energy companies looking into Cyprus also have interests in Turkey and may not want to put those at risk. To us then, the offer by the Cypriot government to provide Cypriot depositors with bonds linked to gas revenues sounds like a nice idea, but will not compensate these depositors for some years, at best. But, remember with a view to Moscow, this is definitely one to watch. Looks to me as if much of the gas should actually be in British water? Does Britain not claim sovereignty over the water surrounding their bases? Extremely dangerous to let the oligarchs have your future mineral rights. Should have put the concessions in a vehicle (give it a taxconcession as well to increase future CF and subsequently the valuation) and do an IPO. Act if you sell to Gazprom to put pressure on the other side. The whole circus would probably not have been necessary. Like with the rest of them you could have seen this one coming for 2 years and they simply wait till things go wrong. Does Britain not claim sovereignty over the water surrounding their bases? Start first with ...Scotland. I have infos that your bases are gonna be sold to ...russian's oligarchs. Take the money and be free of the IMF and the EU. No other entity has offered to pay for the exploration/exploitation other than Gazprom. The 10billion is an 'earnest' payment against future royalties. The UK is never going to pay for exploration. In the end of the day if a lot of gas/oil found, Cyprus can always nationalize if the Russians get too tiresome.